Apollo stretching his legs while we clear out his stable. The sudden onset of the cold spell has caused us dramatic problems at Rock HQ. Late last night I decided to go out and check on the lambs as earlier in the day Sandy had taken a tumble and fallen from the cliff and landed in the brambles (see entry below) and Katy didn't look too bright. I set out into the sleet and snow, unusually for me fully equipped in foul weather gear and with a 2 million candle power torch. It didn't take much effort to find Sandy he was by the gate to the back garden, unfortunately he was on his side and fitting in ice cold water. He was in such a state for a moment I seriously considered putting him out of his obvious misery as there seemed no hope. I carried the wretched bundle of muddy wool into the Kitchen of Rock HQ and whilst Tracey and Beth wrapped him in blankets and stood him by the rayburn I went back out into the night to round up the others. Daffodil and Bonny were easily persuaded to join Apollo in the shelter of his stable. This left Katy to find and after a quick check of the garden the only place left to look was the base of the cliff. Naturally she was there and obviously ill and unable or unwilling to move. 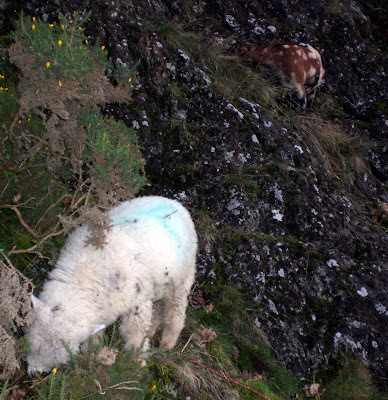 I managed to pick her up and offering prayers to God and all small gods associated with sheep, shepherds and not falling I slowly made my way down the precipitous slope to safety. Unable to see where my feet were going and trying to control a struggling sheep this was not an easy task, snow and darkness only added to the difficulties and two steps from the bottom inevitably my left foot missed its intended encounter with the ground and Katy and I suddenly hit the deck with an ooof and a single word beginning with F. Katy was saved from injury by landing across my chest. A rock distressed at missing its opportunity at playing a major part in this unfolding drama by tripping me took full advantage of a second bite at the cherry and buried itself enthusiastically between my shoulder blades. It was sharp enough to give me a nice neat two inch cut through the Gortex jacket and fleece I was wearing so I am thankful it didn't hit me on the head like I am sure it wanted to. Inside the house Katy was desperately ill, Sandy had perked up a bit but his wool was falling off him in huge clumps, the kitchen now resembled an animal casualty clearing centre. Bernese Mountain Dogs fussed around the patients while we got more warm blankets and towels to wrap the shivering sheep in. A vet was called and within ten minutes attending to Katy. 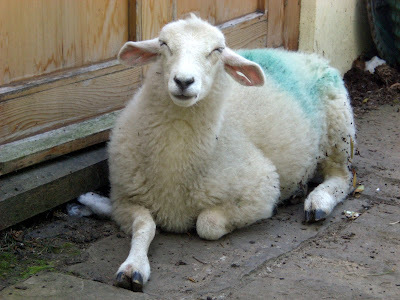 It was through talking to her that we discovered a design defect in sheep. They carry a bacteria, as many animals do, in their tonsils and respiratory system that in times of stress, or at the onset of a sudden change in the weather cause respiratory problems. 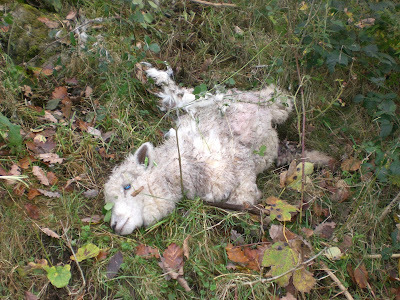 As the vet feared Katy had Systemic Pasteurellosis, no one really knows why this happens, or why its the fit and healthy lambs that tend to get it, sometimes it happens just because they are moved from poor pasture to lush pasture but for whatever reason the first sign is that the lamb is lethargic, difficulty in breathing, this rapidly leads to recumbancy and death in a few hours. Its not preventable and in most cases animals don't respond to treatment. The vet pumped Katy full of antibiotics, steroids and the biggest mineral injection I have ever seen, as you can see from the picture above she was up on her feet very quickly and taking advantage of the facilities of Rock HQ, in particular the warmth of the rayburn. 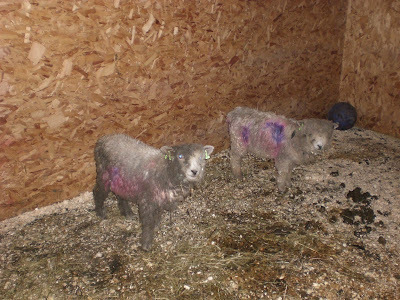 The vet only put her chances at 50-50, the mortality rate in flocks when there is an outbreak is as high as 20%. But as Katy had jumped around whilst being injected we were all hopeful. Sandy was on his feet and positively skipping around the kitchen. Before the vet arrived we had treated him with medicine for liver fluke and had given him a natural remedy containing magnesium (actually one of Tracey's tablets to combat the effects of M.E. 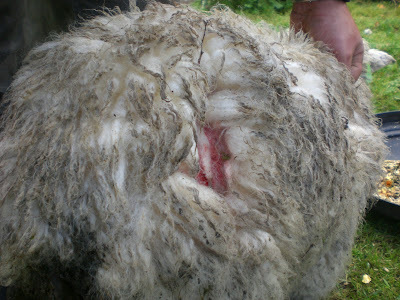 from which she suffers) Sandy had a quick shot of steroids and the vet told us that the reason for his wool falling off was the shock of being attacked by the Fox a few weeks ago. He was OK put out with the others in the stable where he demonstrated how rapid his recovery was by mugging Apollo for his oats. We went to bed just after midnight making sure Katy was comfy by the rayburn, keeping her warm would aid her recovery. 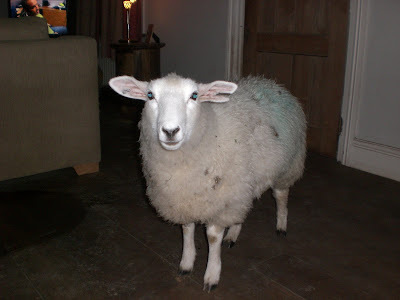 I got up at 4am and found her stood in the centre of the kitchen, little lamb mines and puddles were all over the floor, I took this as a good sign that her internal organs were still functioning. Happy I went back to bed. 8am I got up and she was stood against the kitchen door. She had survived the night so I mixed her a bottle of glucose mix as per the vets instructions and tried to get her to drink. She refused and sat down. I picked her up and put her on the dog bed back in front of the rayburn and turned to get the bottle. When I turned back Katy was dead. As Tommy Cooper would say, "Just like that"
Sandy pictured above, the one with mud all over his face is still fighting his corner and fighting Apollo for his breakfast. With the loss of Katy, Daffodil is the only surviving lamb that we bottle fed in the spring. At least she died in her favourite spot in front of the rayburn. Theres no point asking why or beating ourselves up over it. 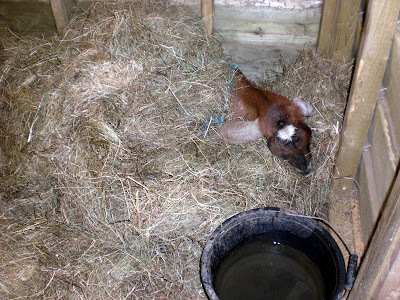 Its not fair, its very upsetting but its all part of the highs and lows of smallholding. Events conspire to make our week off as traumatic as possible. Tracey's Dad is still poorly in hospital and we seem to either pass the time between news bulletins on his progress either engaged in frantic activity to forget about it or sat drinking coffee planning the next job. The sheep are being a bother, the top picture is Daffodil demonstrating at least two rules of smallholding, the grass is always greener on the other side and how did an animal that size get through a hole so small. The bottom picture isn't as gruesome as you might have first thought, its Sandy stuck in the brambles after falling from the cliff. Hes a bit dazed and confused but after a shaky start he made it to the trough for a late lunch. Katy on the other hand is showing definite signs of illness and after consulting the how to keep sheep book she either has pneumonia or rabies caught from a skunk. Winter arrived early today and unfortunately a bitter north wind, rain and snow coincided with a visit from Mr20%, his lovely wife Annie and their friends and sproglets. They were en route for the Red Kite feeding centre and called in to meet and greet the animal clan of Rock HQ. Things started well, some Ryelands looked suitably cute chomping their way through the haystack, Apollo wandered lazily around looking gorgeous and Trevor didn't bite the hand trying to feed it. Geisha goatfully stood up when they oooed and aaahed over the stable door absolutely milking the sympathy vote by limping over so she could be fussed. The guided tour was cut short by the weather, sloshing round in freezing mud, avoiding stepping into various animal pooh whilst patting belligerent animals is an acquired taste that's not made sweeter by driving rain and biting winds and I could see that extolling the virtues of a self supporting lifestyle to captive visitors with drips on the ends of their noses was not the way to make new friends or influence people. Trevor scuttled back to his stable, the lambs hid and I could see my guests had suffered enough so I relented and let them adjourn to the comfort and warmth of Rock HQ. Spirits were raised by hot beverages provided by Bethan and bacon rolls provided by Gerty. The adventurous amongst the group tried the venison and smoked garlic burgers courtesy of Bambi. Having convinced them all of the benefits of home cured bacon I managed to sell some plastic bags with free bacon and free pork in, the bags are so expensive to replace so I have to charge for them, whilst the children watched videos on the blog of the main ingredients. 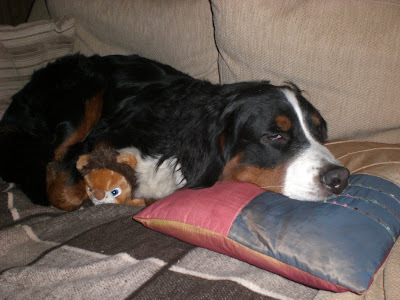 Reba, one of our Bernese Mountain dogs, has convinced herself she is pregnant. Nine weeks ago she was up to mischief with Rocky in the bracken, luckily she didn't end up pregnant but so sure of her imminent motherhood she has started to produce milk, built a nest and has become very defensive of the house when visitors arrive. She has two "puppies" who she attends to, a toy highland cow that moos disconcertingly when she squeezes it and a toy lion that purrs when its moved. 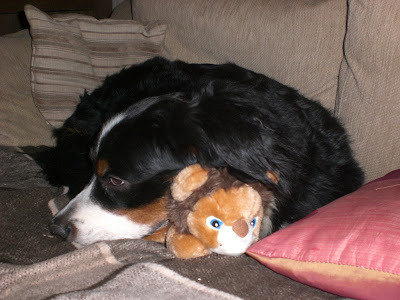 Here are a couple of pictures of the depressed and confused want to be mum looking after the lion, I dread to think what she will be like tomorrow, its her due date. Actually this is a film quiz. Match the titles to the pictures. Death Wish. Death Wish 2. Death Wish 3. The evil glint in Trevor's eye is real, not computer enhanced. 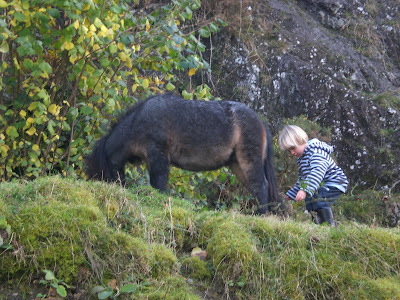 This is little Steve trying to remove a bramble from a ponies tail. How this ended happily I shall never know but somehow Trevor forgave him and didnt stamp all over him. I imagine when little Steve grows up he will swim with Great White Sharks, just because he can. Apollo and Rocky playing chase! Tracey has gone to stay at her Mum's to help with her Dad who is still in hospital so I have been left to run the farm by myself. The bonfire from yesterday was still going but that was nothing compered to the conflagration Bethan and I started by mid morning. When JJ and Kay came up to stay we cleared the hedgerow that kept the garden in eternal darkness. 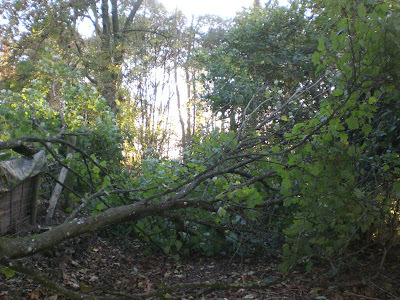 The branches were piled along the lane as at the time we were too busy to clear them properly. These have now been annoying me for a few months now, you can see in the top picture. Today was the day that all changed. For once Bethan was persuaded to come outside after I promised her the sky wouldn't fall in and the strange yellow ball in the heaven was nothing to worry about and she set about the task of clearing the lane with manic enthusiasm. By lunchtime we, well mostly Beth, had removed the offending branches from the ditch and they were burning furiously on a bonfire by the barn. Our efforts were appreciated by Daffodil our pet Ryeland lamb as each pile of branches moved revealed a nice fresh patch of grass for her to devour. Job done Beth and I had bacon butties and I was wondering what to do next when Steve the electrician appeared in the lane with his little boy. 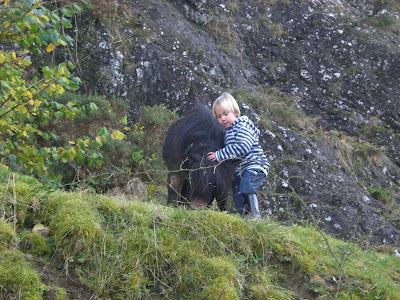 This child knows no fear and once I get his parents permission I might publish a set of pictures of an angelic looking child trying to tug a bramble out of an angelic looking shitland ponies tail. Messing with the dangerous end of Trevor is ill advised at the best of times, however this spectacle was being played out some twenty feet up at the base of the cliff at the back of Rock HQ. Had Trevor done an impression of Buckeroo the little lad would have followed a trajectory like Tigger on acid and may, if lucky, have had his fall cushioned by landing on a fat one armed bloke taking photos. Steve would have been equally unable to assist solve his son's plight as he was carrying a cup of tea and a mug of chocolate milk. If the child survived he would at least have something to take the taste of hooves and blood away. Why was Steve visiting, well he was lending me a chainsaw. Me, alone on the farm with a chainsaw, what could possibly go wrong? I started the beast and remembering the words of Tracey my beautiful and oh so patient wife before she left "Don't do anything I wouldn't do" I decided that what she would do before attacking the trees by the stables with a borrowed chainsaw whilst balancing on a broken ladder using the chainsaw one handed Tracey would practice. So I shouted Bethan to come and help and set off up the lane to prune the Sycamore that blocks all sunlight into the corner of Willow rise. As you can see from the bottom picture the footpath was only blocked for a few hours. I decided to leave the trees by the stable. Today has been a day of reflection and indoor jobs due to the torrential rain. I got up early, actually very early as the clocks had gone back so I passed over the chance of an extra hour in bed in my enthusiasm to get on with the major task of the day, namely preparing Bambi for his stay in Mr Whirlpool. Job done I had a nice pelt to dry as a rug, a huge piece of meat hanging from the rafter of the Black Hole and a bucket of choice bits for the dogs to play with. Nothing was wasted. After a leisurely breakfast of our own bacon and some fresh baked scones Tracey and I got on with tidying up the workshop. An unbelievable quantity of useful bits and bobs had been stockpiled, so much so that it was hard to navigate from one end to the other without tripping. I dragged some really useful cardboard boxes into the sunlight, God knows what I was saving them for as he is omnipotent, me being a mere mortal had completely forgotten their intended purpose. As God was not forthcoming on the clue front I took the executive decision to have a bonfire. This soon developed into a raging inferno on the driveway as I gave up any pretence of reducing my carbon footprint and gleefully threw everything that looked combustible that cluttered up the workshop floor into the hungry flames. At one point I thought I had burst an eardrum when a can of WD40 that had got caught up in the detritus exploded once hot enough but the amazing arc of flame it exhibited as it flew across the yard, its trajectory watched with interest by William, Apollo and myself, more than made up for the pain in my right ear from the initial bang. The homemade firework earned me a "look" from Tracey which meant from then on all rubbish was checked for incendiaries and a promise to be more careful. A lone walker came through the yard, somehow she had managed to keep herself clean on the hill. This was soon remedied by Poppy the Golden Retriever who enthusiastically welcomed the walker by liberally coating her in mud. "Don't worry" she cried "I'm used to dogs" but I could tell she didn't mean it as she was talking through clenched teeth. I found the bonfire a wonderfully cathartic event, there are a few worries and difficulties at Rock HQ but they all disappeared along with the rubbish. Tracey's Dad has had a good day, seems like he will get over this life event without suffering too much trauma. Geisha hobbled out of the stable to see what we were up to and immediately saw an opportunity to get into the feed store undetected so she is getting better. Currently she is sleeping off gorging herself on rabbit food. We came in just before dark, which was a whole hour sooner tonight. I suppose the bonfire must have been quite big as Steve the electrician had phoned, he lives across the valley, he was just checking we were OK as it looked like the place was on fire. 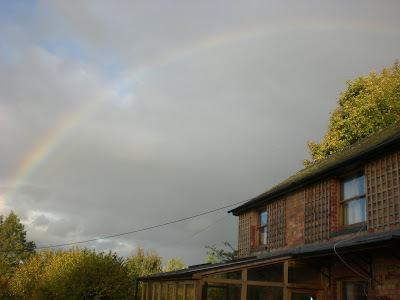 Sunshine on Rock HQ late this afternoon caused this rainbow right over the cottage. Lifes good. Sometimes I imagine Fate as a character watching what we do and when provoked intervenes as if we are players in some great celestial game. My famous last words yesterday about not having anything urgent to deal with at the start of our week off must have really upset Fate, or perhaps Fate was bored and started a new game, whatever, Geisha caught on the fence was just a side issue to the later events of our evening. Before I continue I better explain the picture, its Maggie the Anglo Nubian goat teaching Daffodil bad habits by leading her astray up the cliff, for reference Daffodil is at head height having a munch on some Gorse bush shoots. 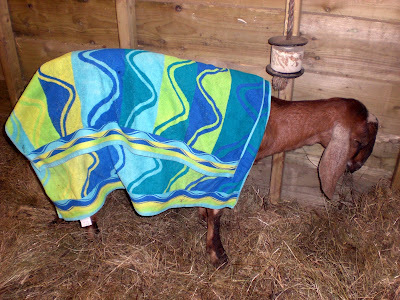 It transpires that while we were wrestling the goat from the wire last evening and struggling to carry her into the safety of the stable, Derrick, Tracey's dad was being admitted to hospital having suffered a heart attack. 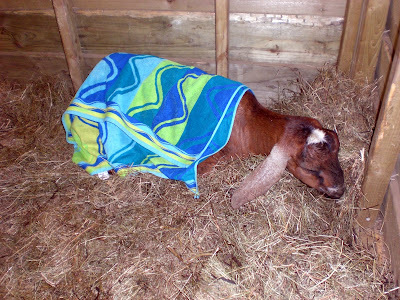 While Tracey and I were sat by our poorly goat, Jill, Tracey's mum was sat next to her very poorly husband whilst Doctors and Nurses tried to make him better. Luckily for him, and us he seems to have rallied and is now being made to rest in hospital under observation for the next five days. 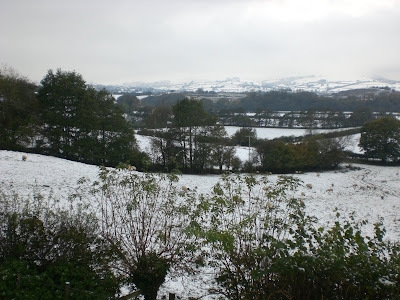 Instead of spending a busy day on the smallholding we spent an equally busy day visiting and trying to come to terms with this sudden turn of events. As we drove through the forests of the Marches on the way home Rene's headlights picked out something in the road ahead. I thought it was going to be a badger but as we got close I could see it was Bambi. Must have been hit by the car in front of us only a minute before. He was very dead, looking perfect as if just sleeping, the only injury visible a nose bleed, must have been a glancing blow to the head that killed it. Bambi is now hanging in our meat locker, the black hole as we call it, so that's the Christmas venison sorted, about 30 kgs worth by the looks. You see, every cloud has a silver lining. It was probably my fault, as we got into Rene after work tonight and settled in the comfy leather seats I happened to comment as I turned the key and started the engine something like "You know this is the first time we have started a week off without having a big job or emergency to deal with." As Rene nosed his way into traffic Tracey and I planned the week ahead, reflected on a good day at work where we had met a good friend who had treated us to lunch, managed to get all the jobs done so we wouldn't be worried about problems at work, all was good in our world yet again. Better still the sun was shining and although this was the last time we would be driving home in the daylight til next year our spirits were high and we looked forward to shutting the gate at the bottom of our drive and concentrating on our small farm for the next nine days. Once home I got on with sawing wood, I can manage this by kneeling on it as my arm still wont allow me to put any real weight on it, not weight enough to stop branches moving while I saw anyway. The magnificent seven raced around, Apollo was mooching through the fallen leaves munching the odd tasty one and Maggie stood and chewed thoughtfully while watching me. After a short time I did begin to wonder where Geisha was, now goats are fairly independent creatures but they are herd animals and half the herd was with me. I carried on sawing and carried in the logs, checked in with Tracey who was tidying up after me in the house and I returned to the stables to begin the mucking out. Apollo had decided to try and get in the garden through the back gate, as I diverted the foal from entering the forbidden zone I could see Maggie had by now abandoned the newly sawn log pile and was half way up the cliff. Again. 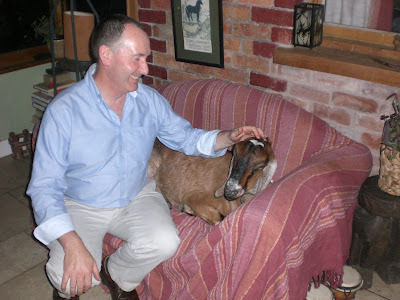 A plaintive bleat alerted me to Geisha's plight. As you can see from the picture she was in real trouble. Now you might think it heartless that I stopped to picture the stranded animal, what you cannot see in the picture is how torn up the ground was in front of her from her struggles and how high up she was at the edge of a drop. Prone to falling myself I wasn't going to approach the distressed goat without backup so took this picture as I waited for Tracey to get to us. Geisha has a huge appetite and what seems to have happened is that she saw me feed the lambs this morning and decided to attempt to jump the stock fence at the base of the cliff. 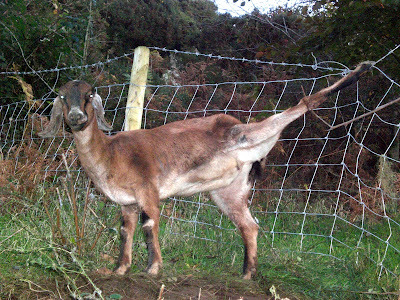 Somehow her hoof got entangled and trapped between the top barbed wire strand and the top square of the stock netting. Stuck fast she had struggled and fallen over the edge hanging for a while by her hoof. Eventually she must have made it back onto the "level" part and was waiting utterly exhausted for us to free her. It took seconds to cut the wire but carrying her down the steep muddy bank was an exercise in patience and teamwork. Luckily Tracey and I work well together and in a few minutes Geisha was wrapped up warmly in Trevor's stable and instantly eating anything on offer. It did get quite emotional at one point for all concerned, especially as we had flashbacks to losing our prize Anglo Nubian milk goat Fuchsia last year who died very suddenly. Her final moments were made as comfortable as possible lying on a bed of hay with her head in my lap. Her last goodbye was to vomit into my lap as she exhaled for the last time. Geisha seems to be OK despite her ordeal, she is cold but has not stopped eating since she was moved to the stable. Her hip doesn't seem to have dislocated like we first thought, she is incredibly tired and in obvious shock but she looks like she will recover. Back in Rock HQ we had a stiff drink, some old Christmas sherry, well any port in a storm and its better than our home brew which is impossible to drink even when desperate laced with lemonade and spoonfuls of sugar. Tracey reminded me what I had said earlier. I shall have to be more careful with my choice of words in future! Our sheep are not spoilt you understand, I didn't spend ages picking up Bramely apples for them, carry them across the mud and drop them off for their dinner. So on tonight's menu they have grass, hay and apples. In the background Maggie the Anglo Nubian cross is trying to decide whether to brave the rain and gales or set off back to the nice dry goat house, calories or comfort, a hard choice for any greedy goat! And I didn't spend ages getting the apples, The Oracles wife gave us about fifty pounds of windfall for the animals. This is Manny, a British Giant Rabbit who has not graced these pages very often as, well, hes a rabbit and doesn't do much. In fact rabbits don't, do much that is, they sit and eat, and hop about a bit, eat some more and hop some more and that very much sums up their contribution to Rock HQ and their life in general. Manny isn't the rabbit who humped to death the chickens earlier in the year, he is a very quiet well behaved rabbit, until yesterday that is. Both he and Sybil were moved to a luxurious accommodation block a couple of months ago, they went from hutches to a palatial pad as big as the goat house with a nice partition to keep them separate. Within a few hours they had demolished the partition and the sworn enemy rabbits have been firm friends ever since. As ever animals together seem to conspire to cause their owners more work. They were missing yesterday. 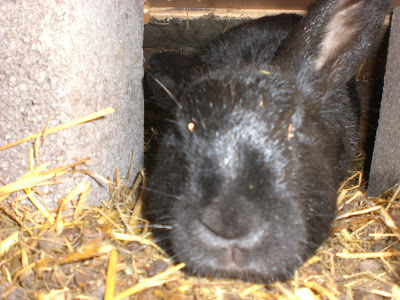 It wasn't hard to find them, Manny had discovered his bunny heritage and had dug a massive burrow under the door and was in the process of making a nice place to live under the path. Suitably chastised for his lack of planning permission he took refuge in his concrete "burrow" and sulked while I hired a JCB to fill the hole in. Two weeks ago the pigs were sent to piggy heaven and now occupy a big chest freezer in the workshop. One little piggie didn't go to the land of ice and snow but was put aside and cured as bacon. For two weeks now I have turned the meat every other day to make sure it cures properly and today was the day one of the collars was ready to try. It looked perfect, and I carefully sliced it with my not quite as sharp as it should be knife and ended up with what vaguely resembled a dozen rashers on the plate. The colour was that of a nice parma ham, incidentally we do have a whole leg in a parma ham box which should be ready by Easter 2009, and it sizzled nicely in the pan. My mouth used to water when I watched the pigs playing in the pig pen, now as part of one fried to perfection I was positively drooling. A taste sensation, a totally different bacon to the shop bought muck produced from pigs kept in worse conditions than battery hens that oozes white slime as it frys because its been injected by thousands of hypodermic needles pumping it full of water, curing agent and E numbers turning it into instant "bacon". This was delicious, the texture was amazing and the flavour an amazing combination of sweet and saltiness that now an hour on I can still savour on my tastebuds. If Wordsworth had of tried our home cured Berkshire bacon perhaps the literary history of our island race would have taken a very different turn. He would have forgotten all about poncey daffodils and instead penned an ode to the bacon buttie. It doesn't happen often but there are occasional days where I question whether or not smallholding is for me. Its been two years hard work, both Tracey and I work full time to be able to live here, then there is the hard work once we get home, the never ending jobs list, the weather and the behaviour of our animal clan all sometimes seem to conspire to make things extraordinarily difficult. Life was so much easier in our three bed modern semi. Our two year celebration of having survived all that's been thrown at us was slightly muted by a letter from the bank informing us of a 50% increase in our mortgage payments. I say slightly as in the same way the Titanic was a slightly bad shipping disaster. Due to the current financial climate no new mortgage deals are available to reduce the cost of living here and the monthly payment is now at a level where we could rent a medium size farm for less. It caused a couple of dark days where plots similar to Guy Fawkes were imagined to punish the wonderful bankers who created the current bust but they left me when I went for a walk around the hill. 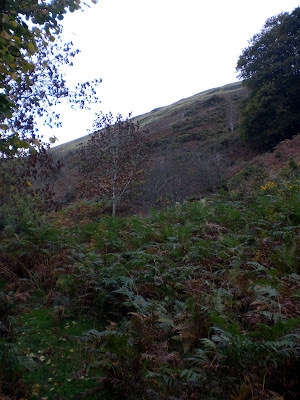 The autumn colours proved a useful distraction, as did the dogs charging around the dead bracken. 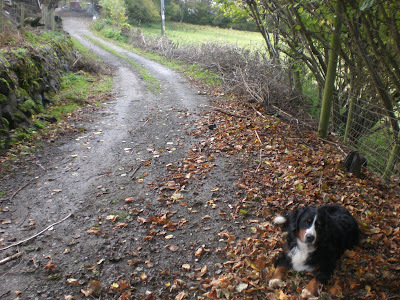 I even managed to lose Faith, the Gordon setter, entirely for the walk, she does have a bright orange coat especially for this time of year so I can spot her on the hill, but today she disappeared until I rounded the final turn home and she came running towards me. A bush spoke to me along the way. Two years ago I would have been startled that foliage should suddenly find a voice, but having Mad Keith the techno hermit as a neighbour its common for him to spring up from the greenery, hopefully fully clothed, and start a conversation that either enlightens or completely baffles. 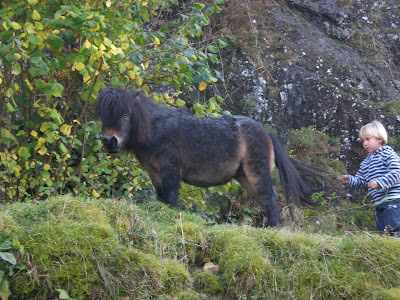 Only last weekend he jumped up from a gorse bush exclaiming "Is that an orse?" As I was gripping the lead rope of William the Welsh Cob I felt it was safe to reply "Yes Keith its an orse"
He climbed down onto the track, William eyed him closely, retaliate first is his motto and no strange man leaping from bushes was going to get one over on him. "Have you ever had an orse Keith?" I asked, hoping he would realise by had I meant owned and not anything unsavoury. He shook his head and patted William chuckling to himself, "No." there was a very long pause punctuated by a plop plop plop sound as William left his mark on the track. "I had a cat though" Keith added, "He was called Tim"
"I dunno, I call him lots of things" and the hermit was gone. It wasn't the hermit who spoke from the bush yesterday, but a traveller who was visiting his horse, Molly, who is on the hill. Molly is massive, able to eat a whole apple in one mouthful and the most gentle attentive beast imaginable. I saw him before he spoke but let him think he had surprised me, we spent a very nice ten minutes or so passing the time of day, talking about the weather, about his horse, how worried he was that she was up here alone. I found I was able to keep up with what he was saying, obviously I had learned a thing or two about horses and didn't make myself look a complete idiot. We parted company and I promised to keep an eye on Molly for him. It might sound daft but that conversation with the traveller confirmed that it really is worth all the effort to live here. The beauty of the place, the community of the valley all make life worth living. Any doubt I had was further expelled on my return to Rock HQ, as I turned my back on Trevor he gently reminded me that he was there by biting me. 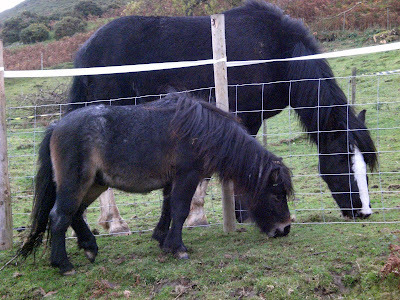 Two of our boys grazing yesterday on the hill. 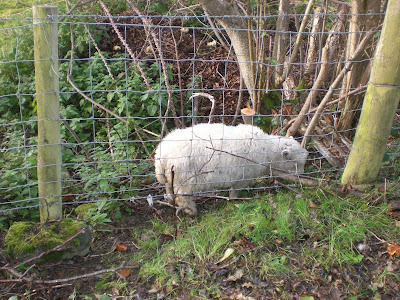 Trevor the shitland has turned back to his original colour having gone through various tones ranging from grey, dirty white and strawberry roan. Horses nibble each others withers when they are being friendly. William still has a bit of an issue with sharing attention with Apollo, they get on well when we are not around but as soon as we appear William feels he needs to assert his authority. Here we can see William being all chummy and Apollo enjoying the fuss, soon goes to pot when William turns on him and if you look at his mouth he has taken a huge chunk out of my little pony! Good job hes so furry. How do we know they get on well while we are not around? 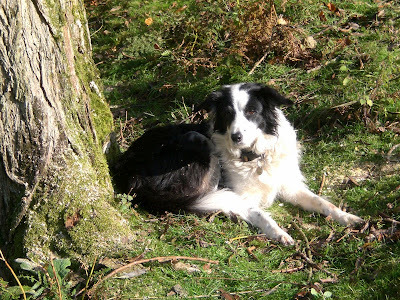 Tracey walked up the hill quietly the other day and found them curled up like dogs on the floor together sleeping. Oh the times you wish you had the camera! Finally I have completed a job that was identified last April as I was perched on a fence in the dark. Jobs have a habit of piling up and before you know it they can get on top of you, prioritising helps but sometimes emergencies put paid to best laid plans and all that. So finally I have got round to replacing the lace in my right boot. Not a major task I'll concede but one which kept getting put off and one that I was reminded of each time I slipped my foot into the lace less boot and set out to put the smallholding to rights. What finally prompted this small but onerous task was chasing Katy across a field yesterday, she had gone awol with Daffodil and both have gone a bit feral. The task of rounding her up was not made easier by the fact that she had taken refuge in a quagmire of mud and water which eagerly held onto my boot as I advanced. Fed up of having one wet foot and having to walk oddly to keep the boot from falling off I have now fitted a new lace. Well its not actually a lace, its a bit of string but it works. Time really does fly and when you are smallholding it seems to pass with reckless speed. Two years ago yesterday we moved to Rock HQ. We decided to buy this smallholding before we even saw it. It was the second house we looked at that day. The first was an overpriced run down grey stone cottage on the roadside with four acres of lush pasture. At first I thought it showed promise, this was before I realised that the lean too I thought was a utility room was in fact the “fitted” kitchen. The whole house reeked of decay and damp and we politely said our thank yous to the owner and set off for our second viewing. Rock HQ is set in a valley hidden from the road. It stands alone facing west across the vista of Welsh hillsides. To get to it you have to negotiate a narrow track that leads into a farmyard, once there you turn right through a black five bar gate and progress slowly up a steep dirt track that levels out before climbing into the canopy of trees that surround the property. It is an imposing red brick dwelling, called the Red House by the locals and known as Rock HQ by all its previous inhabitants. We have deeds and paperwork relating to the cottage dating back to the 1750s but there has been a settlement here since ancient times. 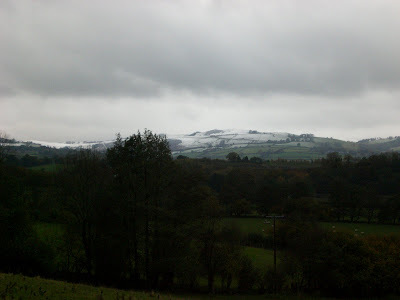 It was a Neolithic quarry and the standing stones on Radnor hill are reputed to have been taken from here. Much like the house the hill its built on stands alone, an impressive dome shaped hill with many rocky outcrops, cliffs and overhangs. The biggest cliff is the back wall of the stone age quarry which is immediately behind the house. Rock HQ was and is perfect. The house had been restored and tastefully decorated, the current owners were both stockbrokers who had decided to pursue the rural dream and gave up London for the good life. After several years of rebuilding and refitting they had reached the conclusion that what they really liked was restoring period property, the call of the wild no longer held any attraction for them so they wanted to give up the farm and start again. Quite why these seemingly rational people give up the comforts of a completed house to live in a caravan for years on end while they rebuild their next project is beyond me. They showed us around the site. The grounds and outbuildings were the complete opposite to the house, evidence of neglect abounded. The “barn” was in fact a structure of dubious integrity that somehow managed to defy the laws of physics and remain standing, mostly. Several sections had fallen in or over and under the debris you could just make out the remains of a stone brick pig sty. 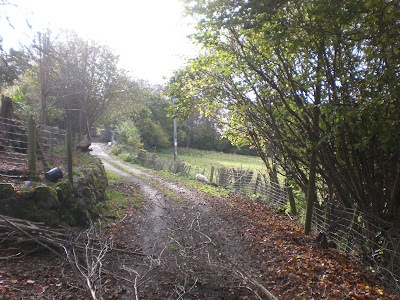 Fallen trees hindered our progress through the garden, the mass of brambles and bracken were reclaiming what was once a productive cottage garden. There was a time it would have had to of been productive, it would have been a major source of food for the family and the surplus sold or traded at the local village market. Two greenhouses stood defying the attempt by Mother Nature to reclaim her territory. To me and my untrained eye it showed promise. Tracey and I had a criteria to be met, she wanted a garden with a Silver Birch tree, I wanted one with a Victoria Plum tree. Side by side on the grassy bank an example of each swayed gently in the summer breeze. The tranquility of the garden was suddenly shattered by a Tornado as it screamed overhead, so low we could see the pilots strapped into the ejector seats. Whilst the owner apologized profusely and explained it seldom happened I reassured him that we loved planes, Tracey loves fast jets while I prefer piston engine aircraft, as I finished speaking a dark grey Hercules rounded the hill and powered down the valley before banking out of sight lost amongst the hills at the end of the valley. Someone was telling us Rock HQ was for us. The fields, comprising around two acres, were lost in the wilderness; barely visible amongst the flora was a perimeter fence that was on the whole upright and stock proof. The ground wasn’t suitable for much more than mountain goats due to its incline but by the time we had negotiated the treacherous ravine back to the house we had already convinced ourselves with a bit of effort it could be transformed from the homage to Jurassic Park to a landscape of windswept grassland where our horses and cows would roam. The vendors were lovely people and put up with us crawling all over their lives, Ben and Bethan were also with us so they explored the possibility of future bedroom accommodation, the speed of broadband connections, local night life and the availability of talent of the correct gender, all vital information for teenagers. Tracey and I concentrated on more down to earth matters like was it registered as a smallholding, how often was the footpath used and what were the neighbours like. The place was perfect and our hearts were set on spending the rest of our lives here and I chose Friday the 13th as the day to exchange contracts, after all what could possibly go wrong. As it happens quite a lot really. Those ten days waiting to move were the most stressful of my entire life. Every conceivable thing went wrong, from the Bank losing our mortgage application to the vendors suddenly having cold feet and insisting that the move be delayed to the 16th, the following Monday. This meant that all our worldly goods needed to be put in storage over a weekend as our buyers were moving in on the 13th. We had decided to move ourselves in a hired van. My best friend helped out in this department, he knew a man with a van. I didn’t think to check which type of van. Come the day, cometh the man in a van, which was a standard transit van, the type of van that has great difficulty in accommodating the precious belongings of a family who had spent 18 years collecting all sorts of junk which now needed transporting across the county to a safe repository. But Rock HQ was ours. Well the majority share was the Banks but in essence it was ours. Which, 24 months later we still are and despite fire, flood, rockfalls, the two wettest summers recorded, getting snowed in and a near fatal accident that has left me disabled and the antics of our animals we still want to be here and still love the life we lead. We have rebuilt out buildings, reclaimed the farm from the wilderness, with help built stables and kennels. Our animal clan now numbers some eighty members and includes horses, sheep, pigs (either alive or frozen), goats, assorted poultry and fish. We have made new friends, met some fascinating people, some the nicest in the world and others who are clearly deranged. Tracey and I have shared the joy of our first lambing, experienced extremes of weather and felt the sorrow caused by the loss of our animals due to injury and illness. All these experiences mean we lead a very busy, full, emotionally rich and varied life about which we have many stories to tell. Within these pages are just some of the Tales From The Rock. This is Stuart, a very nice man who, along with his sidekick Kevin (the photo of Kev blurred) showed me how to chop up the Berkshire Pigs last week. He was very complimentary about the quality of the meat and would have been happy to sell it in his shop. It would be nice to set up as a part time pig farmer but work commitments and current finances forbid any further expansion of the smallholding. We kept a tight reign on the balance sheet this time with the pigs and it cost around one hundred and twenty five pounds to produce the pig, this included piglet purchase, feed, transport, killing and butchering. We have sold some and one is now turning into bacon and parma ham so currently the balance sheet shows that the freezer full of meat, the eighty pounds of bacon and twenty five pounds on parma ham has cost us just over a hundred pounds. A few more sales and the project will have turned a profit. A first for Rock HQ. Should you find yourself in Leominster, Herefordshire, be sure to call in on Stuart in Drapers Lane, he is your stereotypical butcher, a large jolly fellow and he sells the the most extraordinary Dexter Beef which is simply the best meat I have ever eaten! A regular reader of these pages will not be surprised by the clip here of the Ryelands spotting a free lunch and descending like locusts on a felled tree. They have voracious appetites and regularly engage in fisticuffs with other species over meal rights. Most recent examples recorded are their blatant attempts to stop the pigs getting into the trailer by filling it themselves once they spotted the bait laid to entice the pork, I mean pigs to their final destination. Last week they upped their game and took on William the Welsh Cob, a very placid and laid back chap unless you interfere with his calorie consumption, even he was driven off his food bowl as they flocked into his stable like a great woolly tsunami and refused to be driven off either by a bad tempered horse or his equally bad tempered owner. Feeding frenzy over they focus on other pressing matters like formation pooing, this entails them taking it in turns to dump on any clean bit of path, concrete, rock or grass until a suitably slimy mess has been left which will hopefully catch their part time shepherd unawares as he approaches in the darkness of the early evening causing him to slip and launch skywards the bucket of feed destined for another species. The resulting cacophony of swearing and bucket suddenly emptying sound acts as a rallying point to the sheep lurking in the shadows. Another favorite is for a sheep to take one for the team and lie in wait, placing themselves directly in the path of the oncoming bucket carrier. This is a high risk strategy as said bucket carrier is no light weight and by bringing him down they risk substantial crush injuries. Bucket carrier inevitably prevents total change in circumstance from vertical to horizontal by jettisoning bucket and flailing good arm in the dark to re-establish balance. There is only one thing that distracts them from their quest for gastronomic gratification, that is the ram Crispy. This morning they were not in their usual locations waiting to cause mayhem. The gate to Crispy's field lay flat on the floor, the woolly hoarde had broken in and from the look on his face they had a wild night of it. I expect we shall see the results next March. Time does fly on the smallholding. 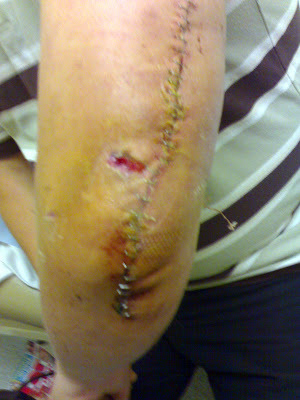 Twelve months ago today this was how my arm looked. Just after this picture was taken I got a version of MRSA which added to the fun and games and it was only the swift action of my GP and the patient care of my wife Tracey that prevented readmission to hospital. Its taken a long time but its healing now and the last of the metal is to be removed December time, hopefully I can start working on straightening it after that. Pete demonstrating how to deal with a defiant tree. Budge is our Jersey Giant Cockerel, called Budge as when he hatched he was the only egg out of 24 to make it and so he sang like a budgie for the first few weeks of his life to try and get chickens to come to him. He became quite used to us, or we to him as he grew in a bird cage in the kitchen and finally when old enough he was expelled to the great outdoors. Once there he established himself as the greatest coward on drumsticks and ran a mile every time another member of the poultry fraternity made advances in his direction. He is a very big and very handsome bird but prefers to live a fairly solitary existence at the far end of the smallholding. Occasionally he will venture up to the stables but only if the coast is clear of bird life, he definitely has attachment disorder and by the looks of his reaction when he sees a hen the thought of commitment terrifies him. He was missing a few days ago, missing usually means death by foxes in these here parts but so far Budge has escaped that fate. Quite how this bird brain of Britain has managed to avoid being the foxes next meal is a bit of a wonder particularly when we found him in a spot of bother like this picture shows. Clearly his spatial awareness is not very accurate as he thought he could squeeze through the gap between the fence, wire, ground and a very large rock. Luckily he was spotted by us before any harm could come to him and after a bit of effort he eventually popped out none the worse for wear. If he didn't have a huge bald patch where his feathers got pulled out as I rescued him you would hardly know he had been through such an ordeal. This is Ben, Ann and Paul's collie watching as his owners bust a gut moving timber in glorious sunshine on the slopes of Rock HQ. Remember as you rest those weary muscles or soothe your aching limbs in a hot bath. From you to make the weekend what it was it took hard work and perseverance, from the pigs it took total commitment! Many many thanks from us all at Rock HQ! Its amazing how much can be achieved in a weekend by a bunch of nutters with chainsaws if you promise them a nice juicy pork roll as a reward. The ground at Rock HQ is not the best, the clue in in the title, Rock, much of it is, it was a prehistoric quarry, modern times residents have scratched out a bit of a living on the hillside but for many years the ground has been reclaimed by Mother Nature. Parts of it resembles the jungle from the land that time forgot and should you feel brave enough to venture into the twisted skeletons of bramble clad fallen trees armed with your trusty machete you do expect to find a dinosaur or two browsing amongst the flora. Tracey and I have persevered and reclaimed much of the grassland back, which is surprisingly steep when you stop and look at it, there were however areas that we could not clear as the job was just too big for two people, one of which has a dicky arm. So time passed, the dinosaurs flourished and we plotted a way to clear the four fallen trees, the numerous broken branches and the unhealthy elder and hawthorn trees that had grown up amongst the fallen timber. We needed many hands to make light work so contacted a few suckers, I mean real friends who fell for the would you like to come to a party hook line and sinker. A few expressed surprise when they asked if there was anything they could bring being told to bring a chainsaw but seeing as they have been to our themed parties before they took it in their stride. Fortune smiled on our brave "volunteers" and the rain held off for 48 hours while they toiled away under my careful supervision. Ann and Paul worked their socks off clearing the first fallen tree off Willow Rise, Trevor the Shitland showed no fear of dogs, falling timber, bonfires or maniacs with chainsaws and closely followed the amateur lumberjacks as each branch moved revealed new grass to eat. A quick lunch and they were ordered back onto the hillside to continue. Pete showed up and his chainsaw was soon put to work alongside Paul's. Pete's was a nice shiny racing red and so went much faster, pretty soon three out of four trees were finished. The bonfires were lit, ostensibly to get rid of all the twigs but also as a defensive barrier should any rogue T Rex suddenly bolt from cover as we tackled the final tree. This enormous Crack Willow must have fallen fifty years ago, from the original trunk each branch grew up from the floor, some having broken and repeating the process and so created an extraordinary labyrinth of decaying boughs and branches covering some hundred feet or so of floor. Chuck into the mix bracken, brambles, hidden drops off rocks and a stream that couldn't make its mind which path to follow so soaked the entire area creating mud pools and slippy bits it was the ideal place for enthusiastic amateurs with chainsaws. Pretty soon I was in a spot of bother by cutting through a branch that I hadn't noticed was actually over me and if it yielded to the saw and gravity could only go one way. My predicament was spotted by Steve the electrician who had brought his wife Jen and their little boy along. He climbed across and while I pushed the branch away he took over the saw and continued to cut. Problem solved and without injury. This last tree wasn't going without a fight and as Pete attacked a limb it twisted and held his chainsaw fast. Steve went to get his, a nice well maintained and above all sharper version of the two we already had out and soon with three saws tearing at it the abominable tree was finally vanquished. As promised all the hard workers were rewarded with as many hot pork rolls with apricot and apple stuffing with a generous helping of apple and ginger sauce as they could eat. Cider, beer and wine flowed and they all tucked in with gusto. Despite their tiredness from their physical labours spirits were raised with each sip and mouthful, all except for Jen. Steve forgot to mention she was a vegetarian! We have spent the day playing lumberjacks. This is Pete, he looks so professional, I shall post a video on Trever Shetlands facebook tomorrow showing the less than professional outcome of this encounter with a tree! 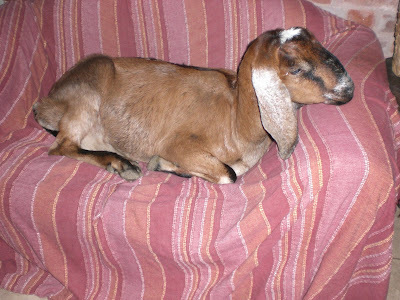 This is Geisha our Anglo Nubian Goat who decided outside was too dark and scary, not to mention really uncomfortable so she let herself in the conservatory and had a few hours kip on the sofa. Tracey founde her there when she went to check the perimeter last night. Paul decided it was a good opportunity to make friends and try and persuade her not to climb onto his car. Pauls a lumberjack, hes OK. I would like to sit here and tell you tales of the last two days that involve humour, my escapades with the two butchers, my attempts to learn how to chop up my pigs, how delicious the pork is, or perhaps the fun we had with the horses yesterday or the glorious weather and how life generally at Rock HQ is fantastic. Except we are under siege from foxes. 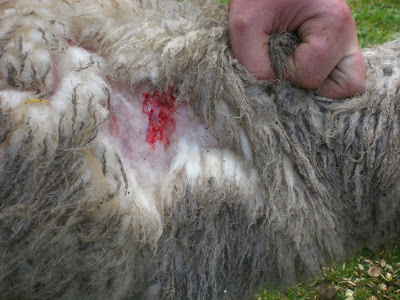 This is some of the damage caused by an old dog fox to two of our lambs in the garden at lunchtime two days ago, the wounds are serious enough for them to be housed and given not quite intensive care, but care enough to prevent the shock killing them. We first thought it was our dogs that had done it, unlikely given they have learned the hard way from rams and over protective mothers to avoid the lambs. When dealing with this aftermath I saw out of the corner of my eye what looked like a fox dash past the gateway, I didn't really believe I saw it but today at lunchtime Tracey saw a ginger animal streak across the garden, our fat ginger cat cannot muster an amble to the food dish yet alone a streak across the garden. With the poultry away its looking for easy pickings and Sandy and Bonny are tiny Ryelands, smaller than the turkeys and Geese the fox has already taken. Last night we saw a fox walk towards the top of the field, a couple of shots at it only made it break into a slow jog before slinking into the woodland. Tonight, well Reba the Berner has just come in from the garden stinking, she has found fresh fox pooh and made the most of it by coating herself with it. They are out there and they are watching. I don't know why she does it, but she does. Later in the day these two wandered into the workshop like the school bullies intent on picking on Steve the electrician as he finished his work. This time he was ready for them and gave chase using the power drill like a machine gun complete with authentic dakkadakkadakka noises. This quiet chap who is more likely to consult a crystal to find a lay line rather than use a power tool as a pretend lethal weapon took the goats completely by surprise and they ran off down the lane as fast as their cloven feet could carry them. 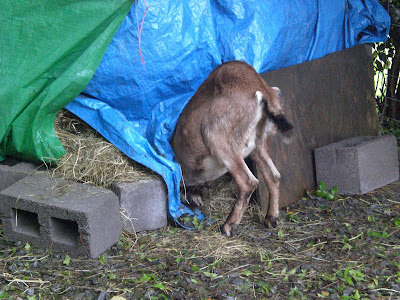 This spectacle was witnessed by Beth, our daughter who was almost as surprised as the goats but stood her ground as a very embarrassed electrician tried to explain that he hadn't gone completely mental and that he only used power tools on goats as a last resort. We now have lights in the stables, a further delay was caused by a mismatched wire but the power of Steve's crystal saved the day and rather than having to strip the entire wiring system to find the break a quick dangle of his crystal and the faulty switch was magically discovered. The lights are excellent, almost like daylight in the stables so we can work after dark til the goats come home. I do have one anxiety though, the light at the end, the one that shines into the wilderness is so bright I think aircraft might try and land here instead of the runway over in Shobdon. So far we haven't woken up to a Cessna taxiing along the drive but knowing the weird and wonderful things that happen here its only a matter of time! That’s how taking the pigs to their final destination went, exactly as planned. By the time they were let out of their pig pen they were like a well oiled machine, each a cog knowing exactly what to do, each pig knowing its duty was to get in the van and enjoy the ride. That was how it went last year. The fear of failure, having heard of all the horror stories other pig keepers had recounted about their efforts to get to the abattoir I was determined I wouldn’t fall victim to insufficient preparation. I spent over a week rehearsing the main event, and when it happened it was so easy, too easy, I forgot the nightmares of what might have been. Wouldn’t it be nice if things went as well in reality as they do in your head? Last year we spent a week training the pigs to follow the bucket along a well prepared pig proof route lined with bales and corrugated steel, up a trotter friendly wooden ramp into the safe confines of a waiting Toyota van lined with more bales and baited with the rosiest juiciest apples sliced up and laid out in tempting patterns, just in case the pigs didn’t feel like a full breakfast these offerings were irresistible. If memory serves correct it was a really sunny day and the whole operation took less than ten minutes and we had allowed an hour just to load them. Within the hour they were safely handed over to the nice man with the stun gun and sent to piggy heaven. I felt wretched about it but consoled myself the next day with slow roast organic home grown pork, and the pigs we raised have lasted us all year. This time, well I know what went wrong, from the outset I was too confident, complacent even, for now I am a seasoned pig keeper what could possibly go wrong? Quite a lot actually and not bothering to get the pigs used to the trailer was just the start and when they were confronted by this instead of their usual trough containing breakfast they were rightly cautious and refused to get in. Then as I was so sure they would go in I didn’t spend a day constructing a huge barrier either side of the trailer to funnel them in, no instead I spent ten minutes putting up a flimsy barricade of bales, a broken gate and a bright green log trolley. You might argue I compounded my difficulties by not ensuring the pigs were very hungry so when faced with me and my bucket of standard pig feed they were more interested in exploring the world and finding much more interesting titbits. It was also raining making the ramp as slippery as an ice rink so when the standard pig feed was replaced by carrots and apples they were loathe to put a trotter on the silver metal ramp as they risked breaking a limb. 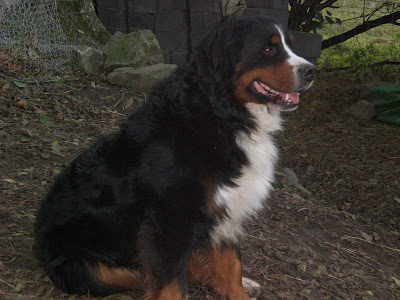 The dogs really helped, I must say, anyone trying to coax four nervous pigs into a strange six by ten trailer would find five Bernese Mountain Dogs careering around barking encouragement a real asset. Even more helpful than the canines were the sheep and goats who have no fear of new trailers and spotting an opportunity for another free breakfast pushed the reluctant pigs aside and were only prevented from breeching EU loading and carrying capacity regulations for small trailers by yours truly who by now had lost the plot and was wielding a fencing post like a samurai sword prepared to defend the pile of carrots held within to the death. Luckily for me and the animal world in general Saint Tracey arrived with a bucket of goodies, disarmed me with a raised eyebrow and patiently sat in the back of the trailer and spoke soothing words to the perplexed Berkshires. These words fell like sugar coated pearls before the befuddled swine who eventually climbed into the back of the trailer with her. Dot is a particularly large Berkshire, massive shoulders and destined to be several hundred dinners. Perhaps aware of this destiny she refused to succumb to the lilting tones that soothed the other porkers and set off in the other direction. Now a word about Berkshires, they are particularly alert for pigs, whereas your Gloucester Old Spot for example has a world that exists in a circle five feet from its nose, head down, it knows its food is there somewhere type of personality suits it fine, the Berkshire on the other hand is a very heads up pig, ears pricked and it has a sense of adventure. Don’t ever think that they cant run either, Dot cleared the bales with the ease of a Grand National winner and ran off towards the stables. By the time I got there she was nowhere to be seen. A whiney of indignation indicated that she had surprised the shitland pony, Trevor, and Dot squeezed under the rails of his enclosure narrowly avoiding the very irate ponies flailing hooves. Now even with two good arms I wouldn’t take on a nearly full grown pig as obviously agitated as Dot so as I ran away from her I consoled myself that no one could see my cowardice, she wasn’t really chasing me and we were definitely both running in the right direction. By the time we rounded the bend I had let her overtake me so Tracey could see that I was in control and bringing home the potential bacon. With Dot back in the make shift stockade we considered our options. Keeping Dot was not one of them; somehow we had to get her into the trailer. 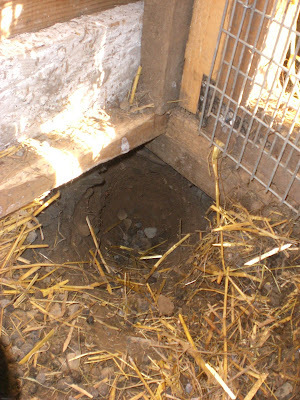 We discovered another rule of smallholding in the process; usually animals can get through holes half their actual body size, especially if you don’t want them to. The opposite is also true, if you want to get an animal through a hole and it doesn’t want to then it needs to be twice the size of the animal, we discovered this as we tried to get Dot in through the trailer door, as we tried to push her in two could easily walk out through the same hole but it took all our strength to achieve this seemingly simple task. In case you didn’t know all pigs are fitted with a secret weapon, if you try to coerce them to do anything they squeal. This is so loud and so effective it renders those within hearing incapable of further movement. Its effect is similar to the siren fitted to the Stuka dive bomber whose screaming dive paralysed those on the ground with fear. As we attempted to lift the uncooperative pig and post her through the doorway she went off like a demon. Once again Tracey saved the day and somehow managed to shout above the hellish din instructions to place the pigs front legs on the door ledge, somehow I managed this and Tracey with her wonder woman powers picked up the quiet end and shoved the protesting pig inside. Door shut we leant against the trailer exhausted whilst Dot sat and sulked sucking an apple. It was now half nine, still had plenty of time to make our slot at the abattoir where I planned to totally embarrass myself by jack knifing the trailer across the yard. Fortune smiled on me and I was able to get another driver, a nice man called Brian to do the deed for me, so yes I am still a trailer virgin. The trailer ramp went down and just like soldiers leaving a landing craft the pigs charged down the ramp. Once in the pen they demonstrated how stressful the journey was by eating bits of food they found in their new, if somewhat temporary bed and flirting with a couple of boars the other side of their gate. This is why we take them to this little abattoir, it’s a family run small concern suited to the needs of the small farmer and the animals final moments are free from torment and stress. We said our goodbyes and left them, by the time we were home we knew they had shuffled off their mortal coils. 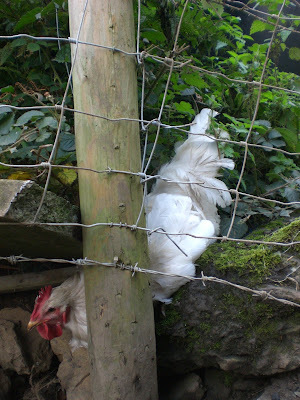 The smallholding was quieter, and we set about the rest of our chores. This was only the start to a very traumatic day, when we got home all was not well with the sheep, suffice to say they were worried, which has a very different meaning to a sheep than you or I, but that’s another tale. Most of the day has been spent preparing for tomorrow when we take the pigs to their final destination. A friends father has lent us a trailer which we collected, my prowess at reversing has yet to be tested, no doubt tomorrow morning at the abattoir I will have to confess to the watching crowd that I am a trailer virgin and have never ever in my driving career successfully reversed a trailer. I predict that after providing much amusement eventually someone will come to my aid and show me what a real man, or woman, can do and reverse the trailer so its precious cargo of Berkshire pigs can be unloaded. 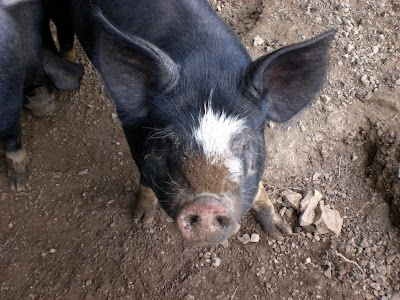 I do feel bad, about the pigs not my inability to reverse, keeping any animal on a smallholding forces you to make a real connection with it. Carrying rucksacks full of apples over the hill for the last few weeks shows a real commitment to ensuring they have an interesting diet, it will also I hope give the meat even more flavour. Its essential any animal you have is tame and used to being handled, otherwise they can become bad tempered, aggressive and a real nuisance and sitting with them while they scoff the apples has proved entertaining and kept them friendly. I tagged them this morning, they are so used to having me handle their ears while they are at the trough that they didn't even flinch as the tagger did its job. So far, its so good. All we have to do tomorrow is get them into the trailer, last years pigs had a weeks training for that, this time we are just going to get them to follow the bucket and a trail of apples to a tempting breakfast at the end of the trailer. It should work and we are not pressed for time as Tracey and I are both on holiday, so tomorrow, unlike the pigs, we have lots of time on our hands. Here we can see Geisha showing total commitment to stealing more than her fair share of hay. Having eaten half her body weight she crawled away to a quiet spot in the garden and slept it off. Its been a quiet day at Rock HQ, the weather was awful this morning, high winds and heavy rain, a typical summers day really. When we dared to go outside the horses took most of our attention, William has chewed his stable so we put up new boards to line the inside walls. This went very well until I demonstrated an extraordinary inability to saw anything like a straight line and pretty soon a straightforward job became an arduous chore that eventually ended when I nearly put a screw through all the wiring waiting to become live once Steve completes the electrical system. Not wanting to cause any more damage I went to see the pigs and fed them some apples and apologised for plotting their demise in 48 hours time. Beth came back from Canada, obviously she had enjoyed her experience but has decided that there is no place like home. For once she is absolutely right! Yesterday was a gloriously sunny day, today it blew a gale and rain lashed down endlessly, so all in all a very good day for a walk. 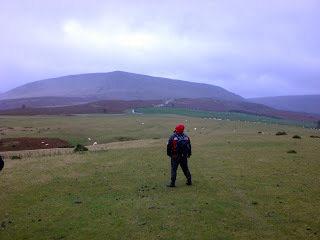 We set off from Pandy and it headed towards Hay-on-Wye along the Offas Dyke path. 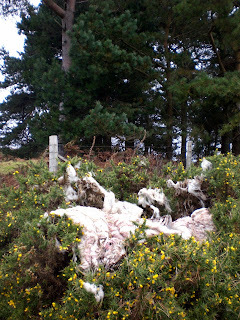 Just as I was telling Richard and Jim that we were going to cross the path where American Werewolf in London began, and that we would probably see bits of werewolf nailed to pub doors in this are we found this grisly sight welcoming us as we began our 28Km route across the Black Mountains. It rained non stop, everything got wet, you couldn't hear conversation as the noise from the rain beating on your hood drowned it out, but we were happy. 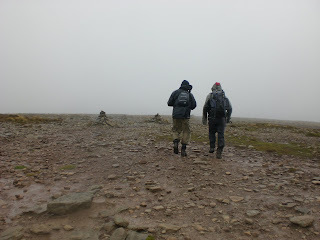 Even crossing the really desolate lunar landscape we remained cheerful. Right up to the point where we joined the road where the main characters of the AWiL jumped form the sheep lorry and began their epic and doomed trek to The Slaughtered Lamb. Jim known for his wit had a sense of humour failure following a cheap bar of chocolate, now named the bar of doom. These are similar to the coins of doom, chocolate flavoured money he ate on our walk in February, see MTB girls blog for that one. He is now banned from cheap chocolate. Anyway he harangued the world in general for cheap shoddy goods as his walking sticks failed to deploy properly and promptly collapsed when he put any weight on them. Thus instead of saving him 20% effort he had expended time an energy carrying them across the hills, and now when he needed them most they were useless. Nothing was going to lift his mood. 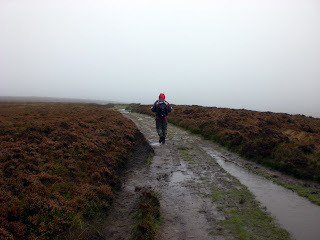 He fumed as he walked the final leg. Richard and I tried to distract him by pointing and laughing but it was to no avail. It was then we saw him. Approaching through the mist, heading straight for us in all his beardy goodness. He drives a dark green Subaru. Sucking on a horse sized pill! Wild night for a goose chase!